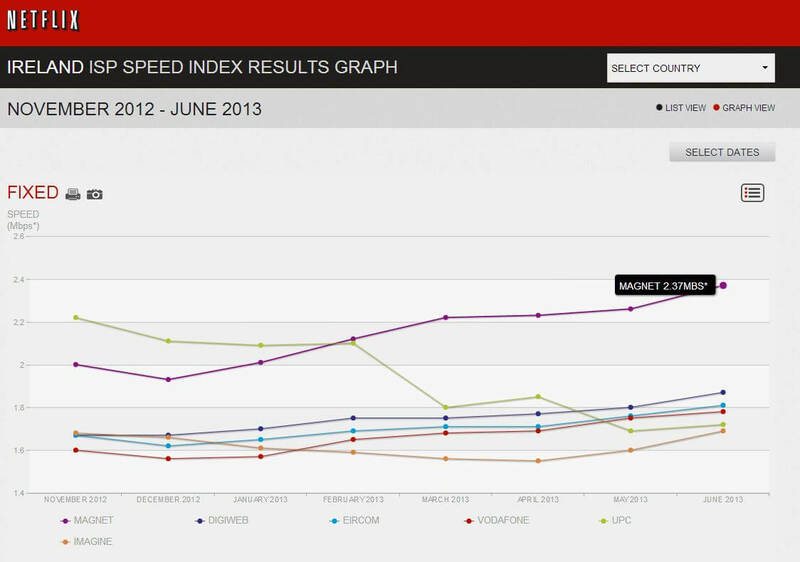 July 9th 2013 – Magnet increases its average speed and maintains its No.1 position for Ireland in Netflix Global Internet Service Provider (ISP) Speed Index rankings for June which were released yesterday. The Netflix Global Speed Index website, aggregates performance results from its 36 million worldwide subscribers in one place, and allows users to see which ISP offers the best Netflix performance in their country. Countries featured include USA, UK, Ireland, Denmark, Finland, Sweden, Norway, and Mexico. The interesting point about this monthly index is that it tracks the on-going progress of Internet Service Providers and their relative network performance according to the speed and quality someone using Netflix can expect to experience. Despite large marketing spends where Ireland has recently seen a complete wash of advertising by competing internet service providers – having an independent globally recognised brand and content provider like Netflix report on the provider with the best actual network speed quality such as Magnet really helps inform people who are thinking of switching and wondering which provider offers the best online experience possible in Ireland. While Magnet remains No.1 other competitor’s networks have fallen dramatically with Magnets network speeds over 26% better in Netflix rankings to its closest competitor ‘Digiweb’ and a staggering 37% faster than ‘UPC’ in this month’s results. This is the 5th consecutive month Magnet holds onto its fastest fibre broadband provider in Ireland position.